Hello guys, trust the year has started in an amazing way for you. 2018 will be a year to remember for me as I saw and experienced so many amazing things. One of the things I won’t forget so soon which happened in 2018 was the rapid growth in the crypto world. We saw the rise of numerous amazing ideas which were built under the blockchain technology so as to offer the world a decentralized way of doing almost everything especially transactions. This rapid introduction of ideas which uses the blockchain technology brought about the influx of several cryptocurrencies as every company has its own coin which will be used on the platform they introduce to the world. These cryptocurrencies introduced all need exchanges where they can be changed to other cryptocurrencies or fiat currency and thus new exchanges rose up in 2018 and were introduced to traders who desire to exchange their tokens / cryptocurrencies into other cryptocurrencies or fiat thereby competing with already existing crypto exchanges. An amazing year indeed. • Having a very complex user interface for basic operations having too much emphasis of unimportant tools which traders don’t need or use. • Lack of easy-to-use trading from charts, a tool used by traditional exchanges for years. • Only few of the most common coins and tokens are offered by even the biggest exchanges. • Daily and monthly restrictive transaction limits being imposed by most exchanges. The team having gone through their analysis and discovered these lapses came together and in an attempt to give the world a long lasting solution came up with an amazing idea, one never seen or heard of before called SONATA. Sonata will build an exchange which will meet the expectation of large trading volumes, thus offering solution based on scalable microservices architecture. 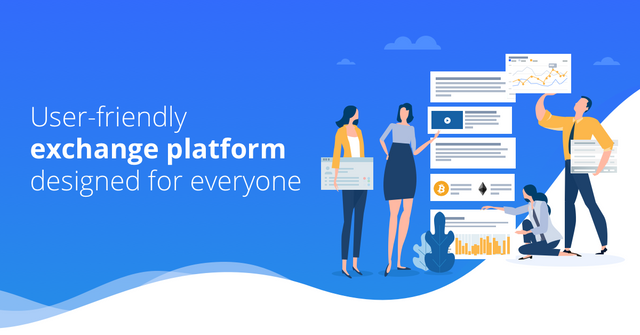 Sonata has a goal to create a balanced, easy-to-use product suitable for entry-level users while providing advanced features which experienced investors need. The company’s motto is maintain continuous technological and functional development of the product. Sonata is backed up by huge investors, the main one being Solidni Finance, a.s. company. This company has been active in the investment for years since 1994 and will provide all necessary financial resources which Sonata needs to complete their amazing project. Thus, the Sonata team won’t be bothered about finance and can put all focus on building a high quality product. ICO will just be used for marketing campaign to reach out to people so they are aware of the project and not to gather financial resources. That’s not all, Solidni Finance, a.s, also cooperates with brokers and stock brokers who help the team with user experience testing and provides advisory services in processes behind the curtain. No doubt, Sonata is a project that will have a strong position in the multibillion cryptocurrency market. • Holders who want to gain passive income from transaction fees which Sonata will divide between investors. • Experienced users who search for better trading platform for replacement of his or her current exchange. • Strategy providers and asset managers who manage asset portfolios of all their clients. • New users who search for the business opportunity and require help of a community of professionals. • Exchange specialist who knows how to maximize all his earnings with the use of a few different exchange platforms. • Owner of large amount of cryptocurrencies who desire a safe way to multiply his holdings via high interest P2P loans. Sonata’s platform will be built to have an necessary features and even more. Sonata will put in place features which includes high level security, low transaction fees, a very user friendly interface, margin trading, AI algorithms predicting price trends, Bot-friendly API, social elements, all coins and tokens in one place and also ability to use it on mobile devices. Sonata has planned a good mobile application with a good user experience having all features which the web exchange will posse. Sonata has its own token with the ticker SONT and it is based on Ethereum Blockchain system and also standard ERC20 compliant. Sonata will carry out an ICO during which 250, 000, 000 tokens out of total supply of 500, 000, 000 tokens will be offered for purchase. This ICO will commence 8TH October, 2018. The Sonata token sale will be limited by amount of tokens and not by time. Sonata plans to keep the price of SONT tokens stable and to do this they will lockout the tokens and release them in regulated quantities with a period of time. SONT will be sold at $0.1 per SONT tokens and minimal transaction is 1, 000 SONT. 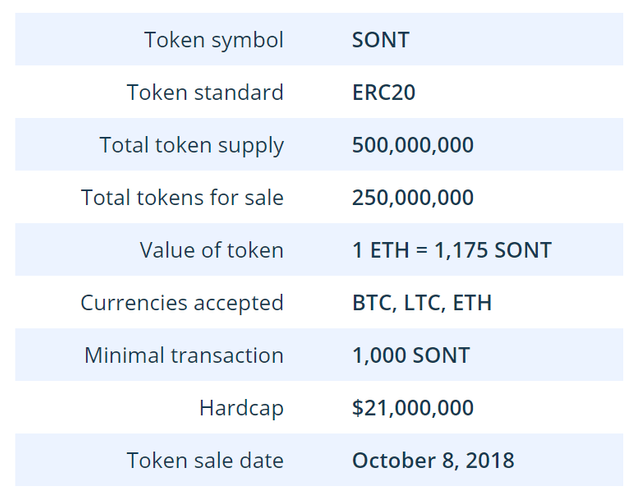 Sonata’s hardcap is placed at $21, 000, 000. Sonata’s token sale will be in different phases and the first phase which is the private sale will have 100, 000, 000 SONT tokens for sale with no bonus. The second phase, public sale 1 will have 30, 000, 000 SONT tokens for sale with 15% bonus, the third phase, public sale 2 will have 50, 000, 000 SONT tokens for sale for 10% bonus while the last phase which is public sale 3 will have 70, 000, 000 SONT tokens for sale for 5% bonus. First cryptocurrency investments. We are searching for a single exchange platform that would fulfill all our expectations. We fail to find one. We enjoy cryptocurrency and we see enormosus potential in this branch. We are thinking about ways to enter the cryptocurrency market with a new product. The idea is born. 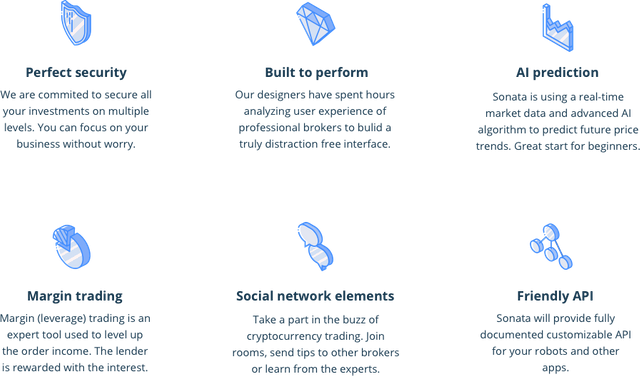 ; Sonata will become a cryptocurrency platform designed for exchange, trading, P2P lending and maybe even more. We set up a team of designers, developers, marketers and specialists in the field of exchange market analysis. We create a simple currency exchange aimed for the Czech market; SonataCoin.com. There is a lot of potential for a new full-fledged exchange and the team agrees to start the development of such a service. The first internal version of the exchange. The AI for price prediction is consulted with AI experts and we can see the first results of short-term predictions. The public sale of SONT tokens is launched. We strongly believe that the investment will be beneficial for investors, thanks to our smart payment mechanism. The mechanism pays out 80 percent of trade fees back to holders. The first public beta version of our exchange platform is released. Holders of our tokens are given the opportunity to be the first ones to try using it. The first versions of mobile apps for Android and IOS are released to public. We are publicly testing AI price prediction. The exchange application is continuously upgraded. We are implementing our own AI prediction of cryptocurrency prices. A large number of altcoins is listed. We expect almost 200, 000 active users and the average daily trading volume of roughly $300, 000, 000. Public listing of altcoins and other tokens. listing of sont tokens expanded to other exchange markets. You asked for a perfect exchange, now Sonata is here. Waste no time and go through the website and whitepaper for more information about the Sonata project.